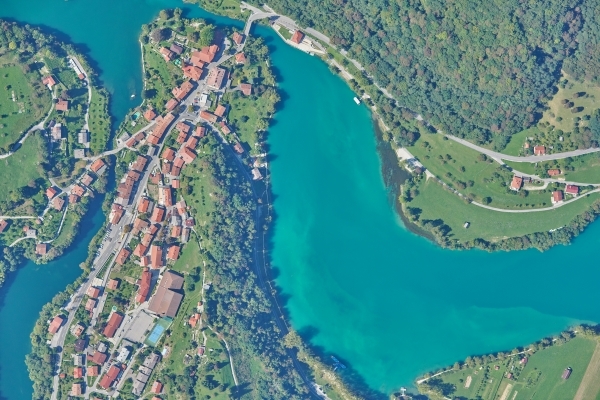 Three western Slovenian municipalities decided to update their spatial data records and they entrusted Geavis with the production of new digital orthophoto maps for their areas. These are the municipalities of Tolmin, Kobarid, and Bovec. New orthophoto maps will be used to update the raster layer of their spatial information system, which is important for successful operations of municipal services. Due to a number of the new features and changes in the use of space, mainly on the infrastructure and built objects, the old spatial records have no longer reflected the actual situation. In addition to updating the data, municipalities also wanted to improve the ability to interpret orthophoto maps, which meant that we had to obtain digital orthophoto maps in better resolution than the old ones. The aerial survey area was very diverse and hilly terrain. In addition to high altitude differences, the terrain was characterized by differently oriented valleys and long shadows of high ridges. Due to the demanding terrain and its large area, aerial photos of the site were taken by Aerovizija, a company licensed for aerial recording with a manned aircraft and very effective in these conditions. Aerial photos of the entire planned territory were obtained in two parts. In the autumn of 2017, the shooting of lower places, and in September 2018, the recording of the high mountain valleys and tablelands, which had been covered with snow and poorly visible due to long shadows of high ridges in autumn 2017. Through georeferencing, the aerial photos were then properly orientated and placed within the National Coordinate System. For georeferencing, we used 220 ground control points from the geodetic reference network obtained through GNSS measurements. The surface of the obtained orthophoto map is 90 km2, but due to the large disparity of the terrain, we actually processed as many as 215 km2. 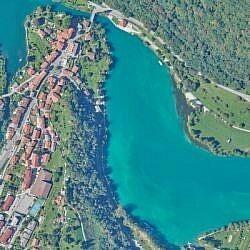 The new orthophoto plan is of better quality and higher resolution in comparison with the existing materials which were made between 2014 and 2017 at a resolution of only 25 cm/px. In our project, we agreed on a better resolution of 10 cm/px. 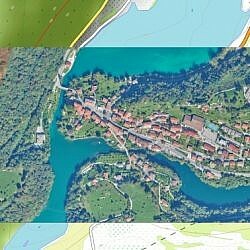 The new orthophoto maps have been already incorporated into the spatial information systems of the municipalities Tolmin, Kobarid, and Bovec. The improved resolution makes them easier to identify details directly from photos and saves us multiple on-site visits that were necessary in the past when images were of lower quality and needed checking things on the spot. Moreover. 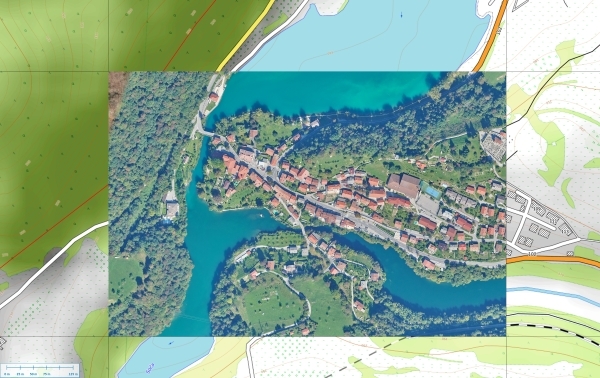 The new orthophoto maps bring the municipalities numerous other benefits as they can use it to conduct planimetric measurements, place various vector layers on it (e.g. municipal lines) or to cover 3D models, for example.